Bayern Munich players and staff visited Pope Francis at the Vatican on Wednesday, a day after the German side beat Roma 7-1 in the Champions League. Pep Guardiola's side scored five goals in the first 36 minutes as they recorded their biggest European away win on Tuesday. They top Group E with nine points from three games, five ahead of Roma. 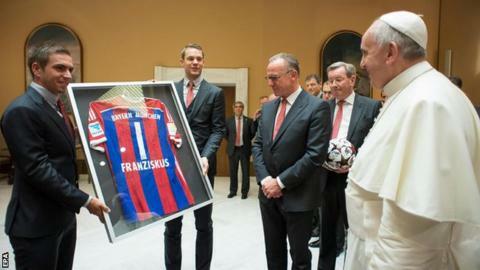 Pope Francis told the Bayern delegation they had "delivered a wonderful game of football", the Bundesliga club said. Bayern captain Philipp Lahm and goalkeeper Manuel Neuer presented Pope Francis with a framed and signed Bayern shirt with the number one and the name "Francis" on it. Arjen Robben scored twice for Bayern, while Mario Gotze, Thomas Muller, Robert Lewandowski, Franck Ribery and Xherdan Shaqiri also got on the scoresheet. "I am still convinced that Roma are a tough team but we really must thank our coaching team because they prepared us outstandingly for this game," Robben said. "I have never seen anything like it, at least not against such a strong team like Roma. They had no answer to our attacking game and that quickly decided the match."